If you spot lines in front of Ippudo, don't be intimidated by them, nor by the way they organize the line, with a solitary machine offering numbers. 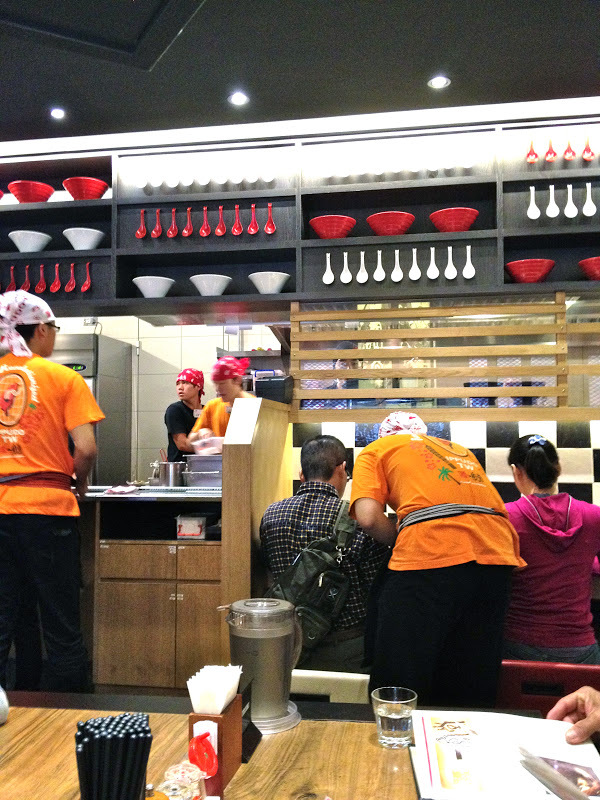 Opened last spring, the Taipei branch of the popular Japanese ramen shop (also with a branch in NY) had up to 2 hour waits when it first opened. Yes, TWO HOURS! I didn't want to wait that long, so I waited until the crowds died down to go. 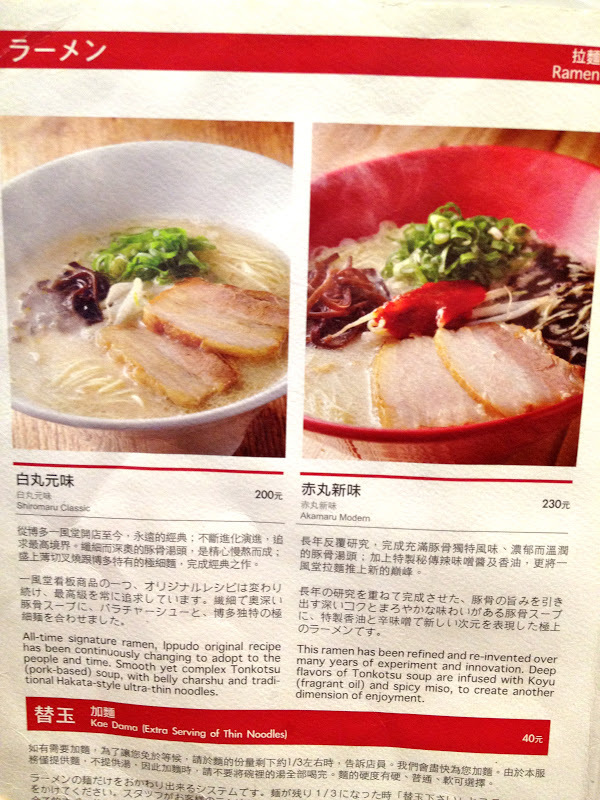 Taipei is crazy about ramen, as we saw openings of both Ippudo and Santouka in Taipei last spring about the same time. 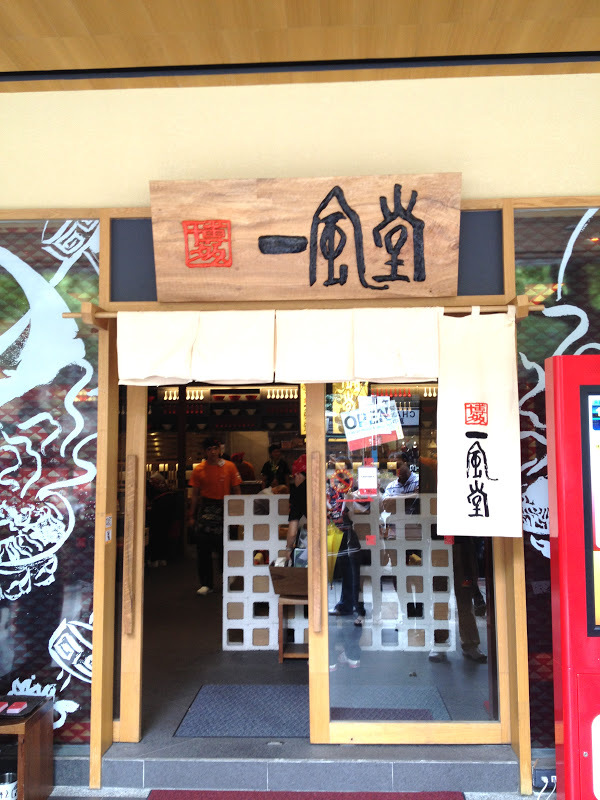 But when I went, months after the opening, there was still a bit of crowd. There was no formal line, so I wandered closer to the bright red machine to see what the deal was. 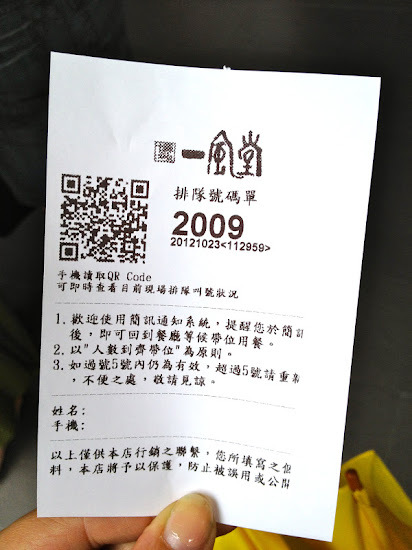 Numbers differ for parties of 1, 2-3 or 4+ and after a bit of navigating, guessing what the mostly Chinese directions were and button pushing, I got a ticket with a number. I punched the number "2" and then "ok" and there was another screen after this to push confirm. Luckily that day, everyone got seated fairly quickly... I think we were seated in less than 5 minutes. They won't seat you until everyone in your party is there, so either have everyone be on time, or eat with only a few people. 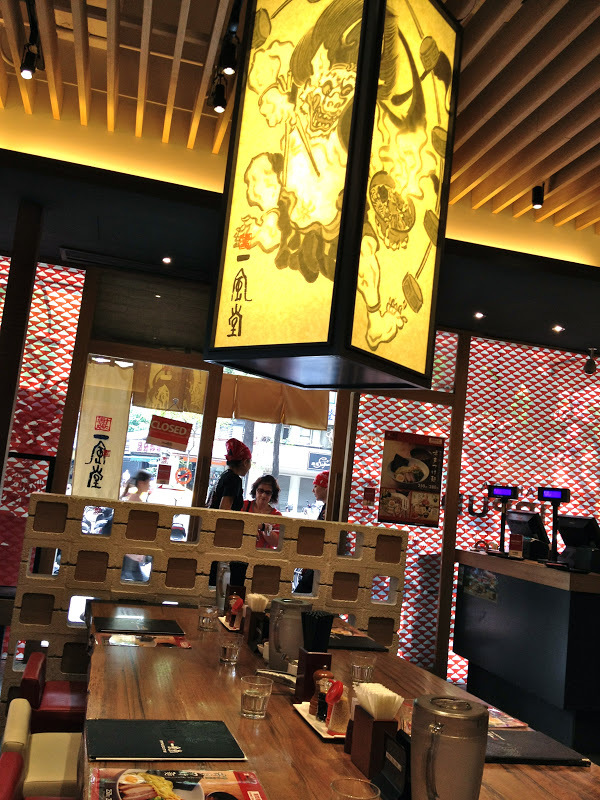 Once inside, the ramen shop is visually stimulating, using red and white ramen bowls and spoons as pop art deco along the walls and above the bar seating. 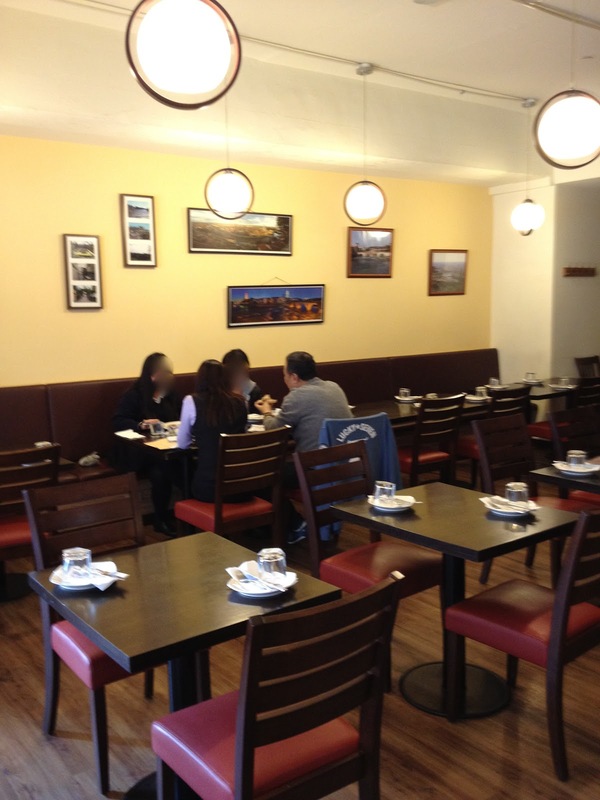 There's actually a lot of seats in the dining room, with different sections of booths, large tables and a long bar. If you're looking for more in the area, after your ramen, you can walk a few blocks to Taipei's MOCA, or Museum of Modern Art. 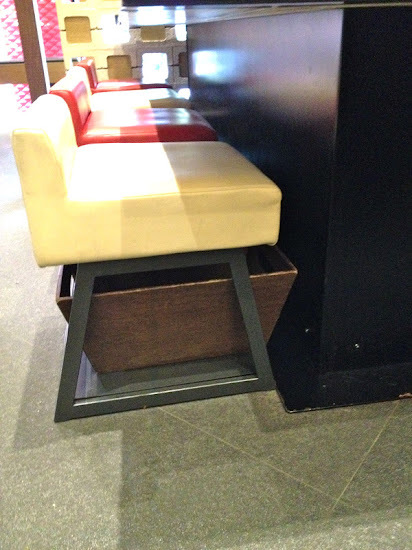 There's a handy basket underneath each stool/chair for storing your purse or manbag or umbrella. The English/Chinese/Japanese menu has four main ramen choices- Shiomaru Classic, Akamaru Modern, Ippudo karaka and a brothless vegetarian. 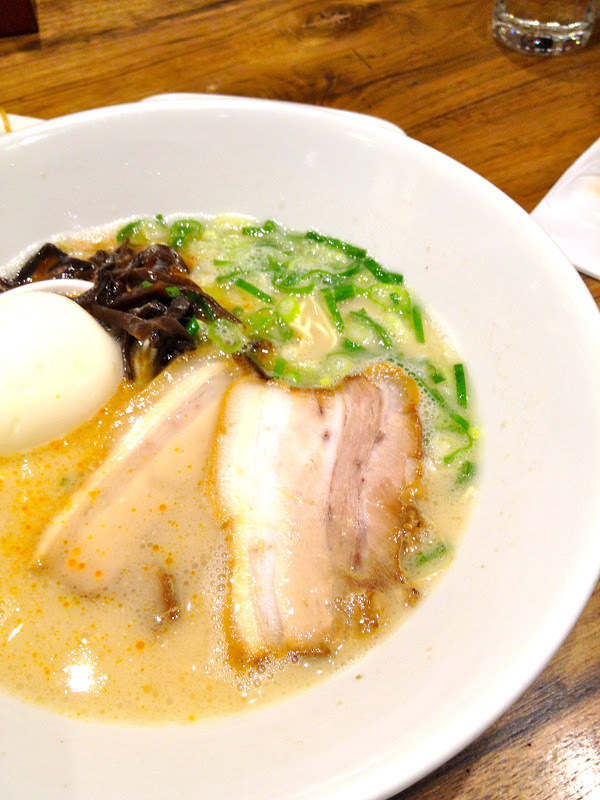 The Shiomaru focuses on the classic white pork broth, while Modern adds spicy miso, while Ippudo Karaka adds spicy meat sauce. Vegetarian should be self explanatory. 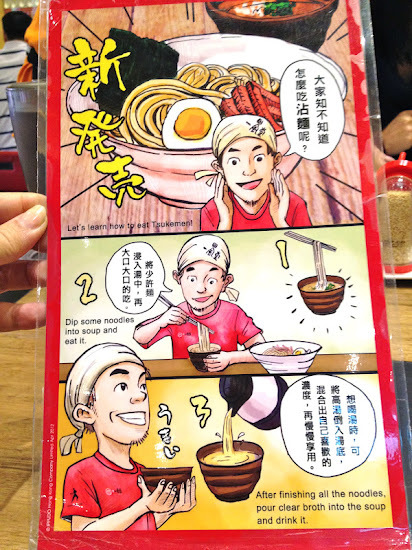 When I visited Ippudo Taipei for the first time last fall, they also offered a tsukemen for a limited time which I should have tried, but I wanted to try the classic first. 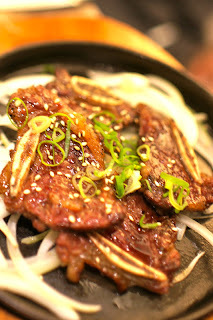 There are small plates of cold dishes and hot appetizers to fill you up. 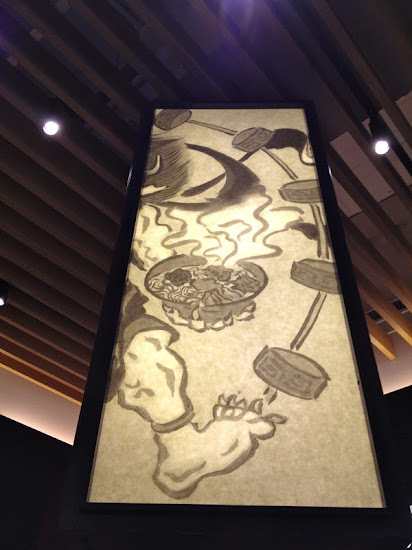 My favorites out of the bunch were the Japanese fried chicken and the Ippudo Spicy Tofu in stone pot. 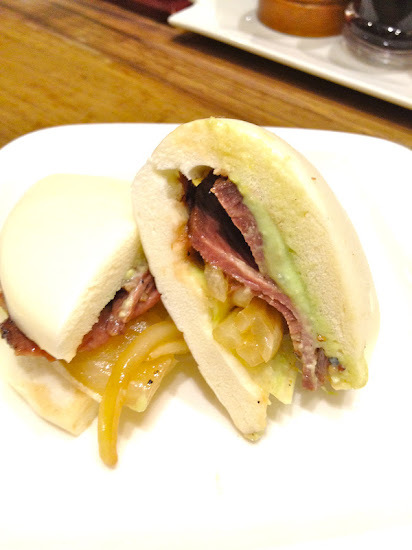 Ippudo also offers up a fusion gua bao style bun, giving Taiwan credit for the fatty pork sandwich concept, but making their own twist on it, stating on the menu that the collection is "born in Taiwan, reborn in New York." Yup, you'd better recognize! 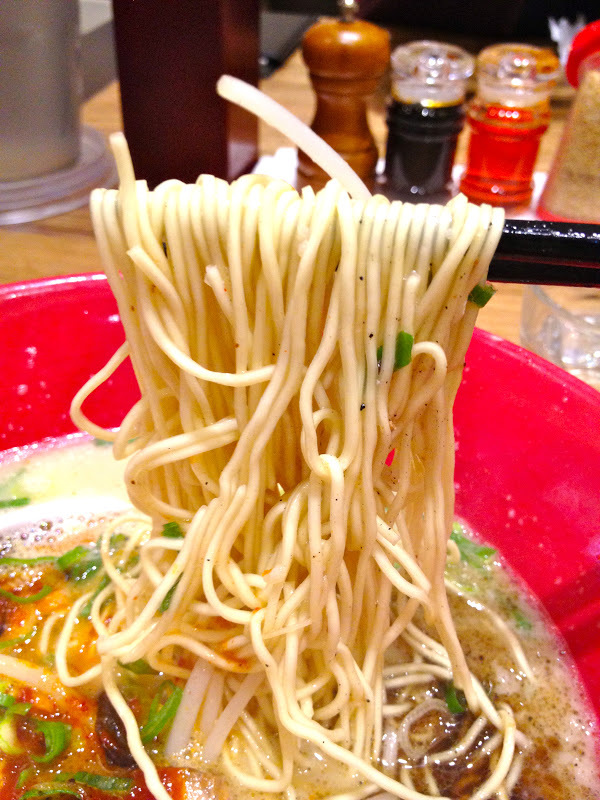 Check out the spices and garlic press while you wait for your food to see if you want to add some sesame seeds or crushed garlic to your ramen. If you want to add some veggies to your meal, you can add a couple of small cold dish appetizers to your meal. 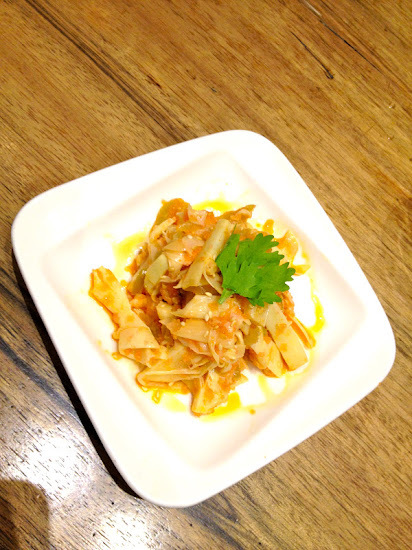 I liked the chili bamboo with mentaiko (NT$55) over the chili oil sprouts (NT$55). During my second visit, I noticed they added some dishes to the menu. Ippudo's bowl is just the right size, and if you add an egg (for NT$30), the soft boiled egg comes whole. 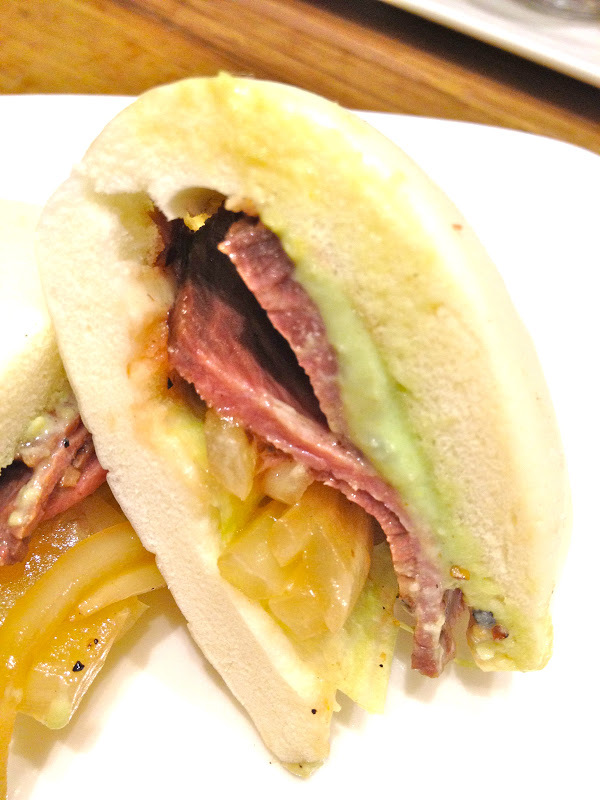 The meat is sliced fairly thinly, but is melt in your mouth tender. 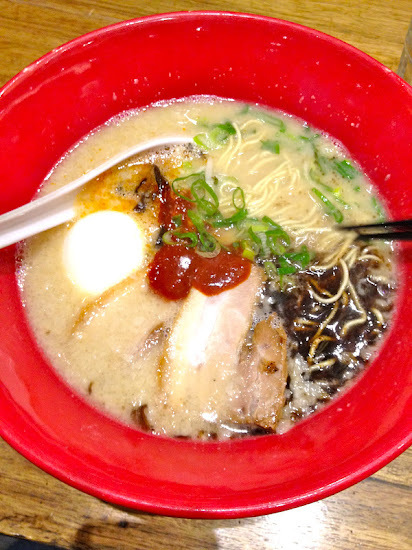 Everything in the bowl is hot, so it doesn't taste like some ramen shops where they dump cold ingredients in and assume it will be warmed up by the broth. 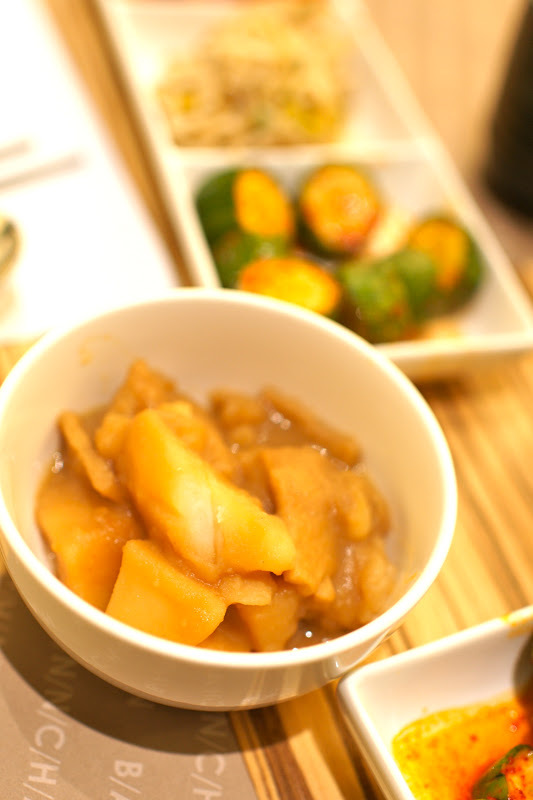 The shiromaru classic (NT$200 + NT$30) is a milky white pork broth and pure deliciousness. The ramen is on the thinner side and is ordered either "regular" or "firmer," but I thought "regular" was just the right amount of al dente chewiness. 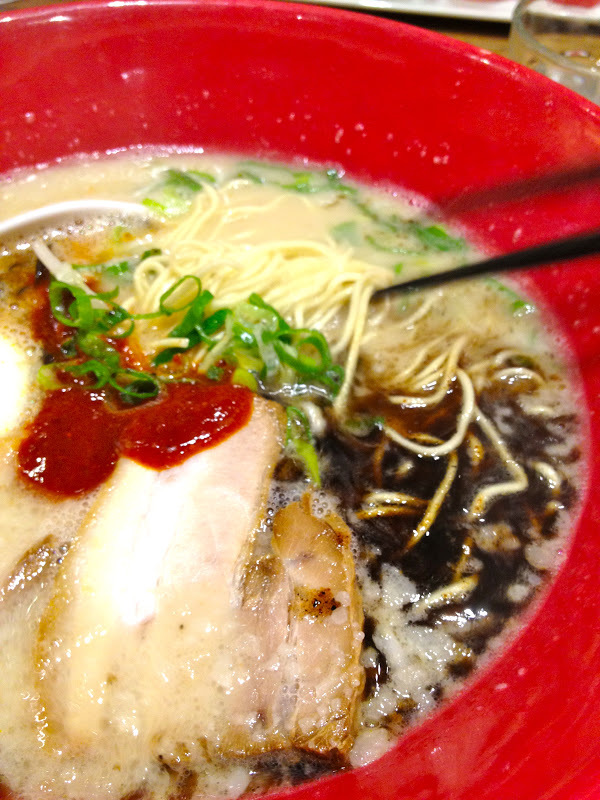 The red bowl is the Akamaru Modern (NT$230 + NT$30) and comes with some secret sauces (chili, sesame, miso) to mix into the pork broth to give a richer, layered spoonful. 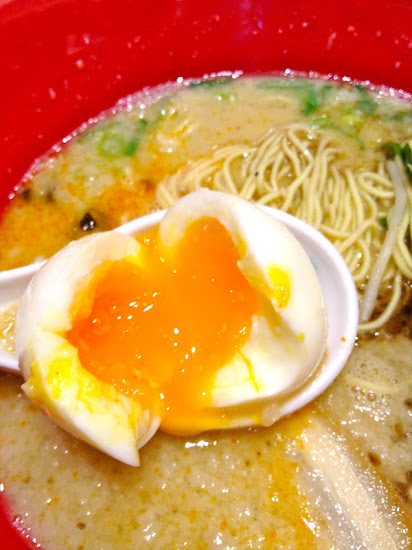 Love how perfect the soft boiled egg is, gooey egg yolk, but not too runny. I had to try the buns and the roast beef with wasabi (NT$90) was more interesting than the pork belly.. it was good, but not amazing. 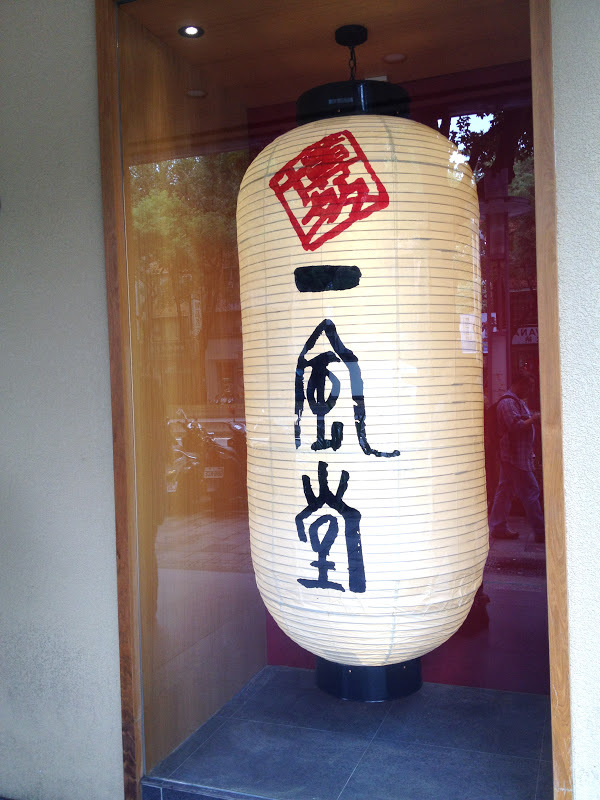 Skip this and go to the night market and get the real thing for half the price. There's quite a list of ramen shops growing for Taipei eats, so I wouldn't wait an hour for it, but if you're looking for a good bowl of noodles, you can be sure Ippudo is on it. 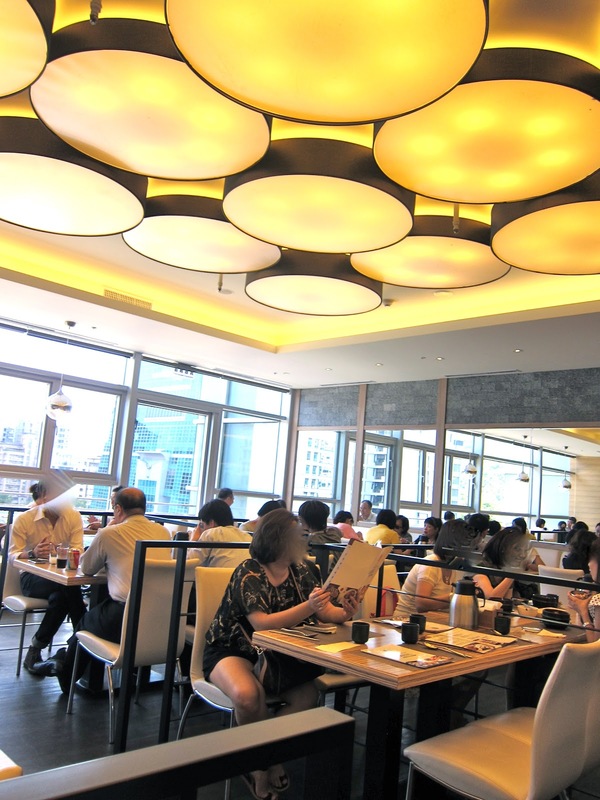 BANNCHAN is one of the many restaurants in ATT4Fun, but is one of the few sit down Korean restaurants in the Xinyi area. So that's why I end up there from time to time since the food is good, but the service is often lacking where the servers clump together behind the counter and you find yourself waving them down. The table seating is grouped mostly for parties of 4 or less, with a few larger tables in the back suitable for 5-6 people, and along the right side. The tables are not moveable like most restaurants and they are quite rigid about not allowing you to add on a chair at the end of the table, so on a recent visit I had to wait longer since our group of five didn't want to be split into two parties. Kind of annoying when there are empty tables at a restaurant, so just something to note if you're dining with your family or a larger group. Besides soondubu, BANCHANN's menu also includes fusion sushi rolls, korean fried chicken, seafood pancake, kimchi fried rice, kalbi and bulgogi, as well as a few combo sets. 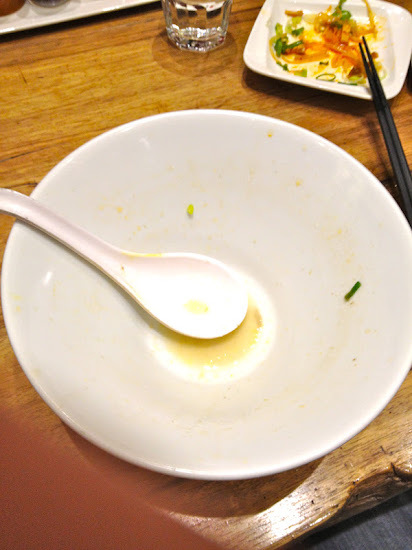 For a restaurant named BANCHANN you'd hope there was an abundance of the small cold dishes the restaurant is named after, but the selection is slim and certain ones change daily. 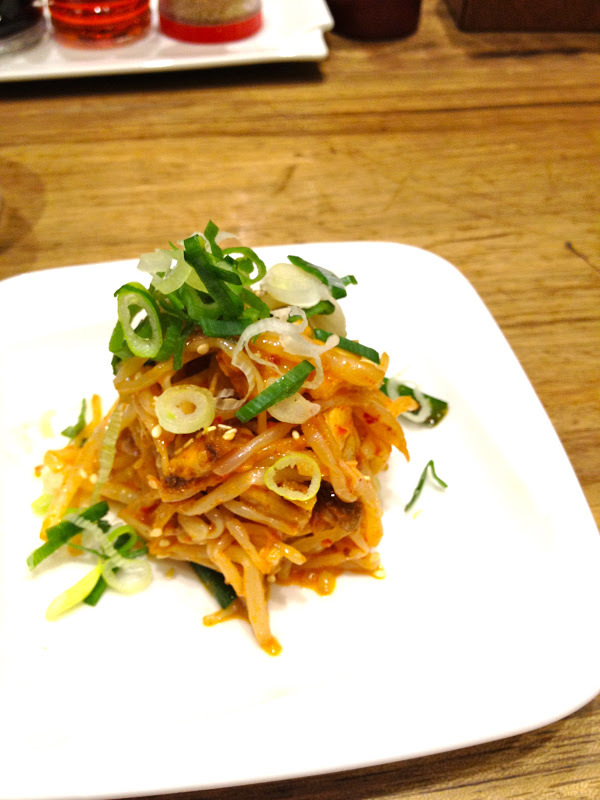 One time I came, there were potatoes and another time jap chae (korean glass noodles). It's too bad they don't offer all of them all the time. But they are generous with the refills and the refills are free. 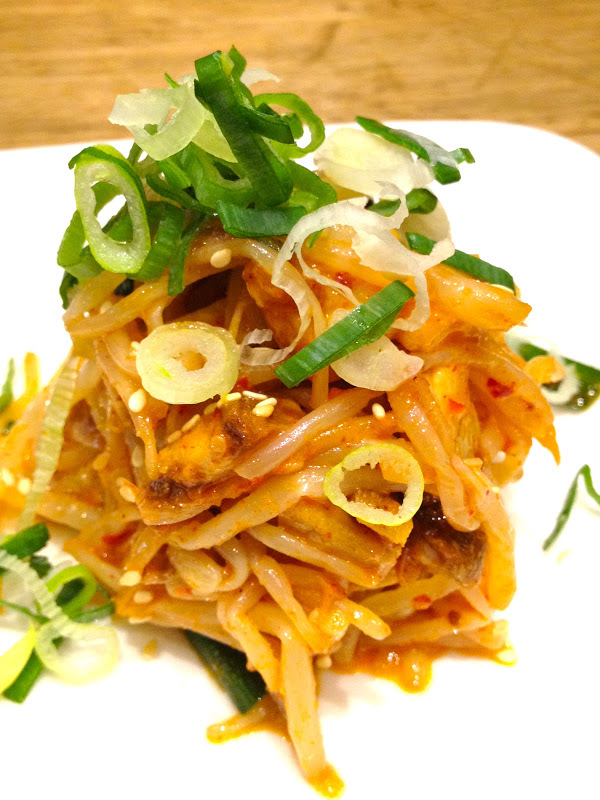 There's always kimchi, bean sprouts and spicy cucumbers with one or two of the daily offerings, and usually a small whole fish will be offered to the table (which I usually decline). The tofu comes in varying levels of spiciness (from none to very spicy) with flavors like seafood, kimchi, clams, oyster, miso, combination, vegetarian, mushrooms or curry. Along with the tofu, there's also a choice of white rice or purple rice. I would stick to ordering the tofu and either bbq beef or the Korean fried chicken. The seafood pancake was surprisingly small, portioned for 1-2 people, but they'll cut it into smaller pieces for larger groups. 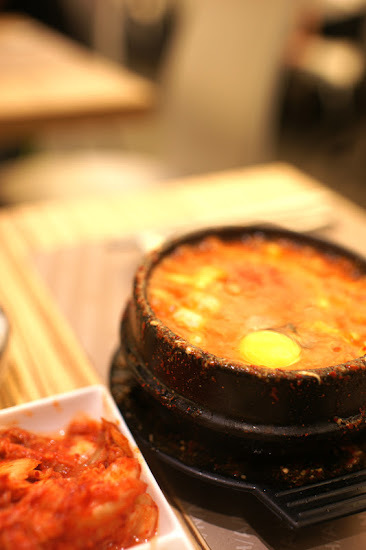 But the soondubu is good and I often find it easier to walk in than some of the other more popular Korean tofu places in Taipei, even thought they don't take reservations. 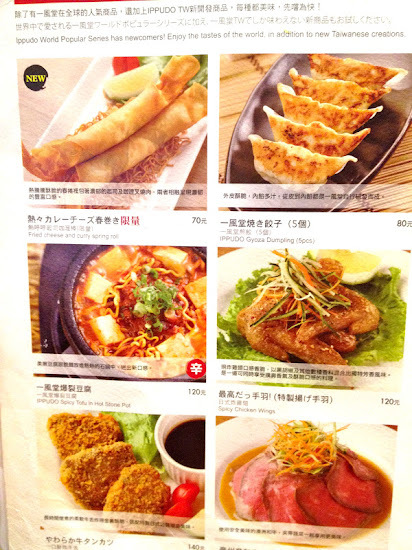 The combination tofu (NT$260) comes with shrimp, clams and oysters with a choice of beef, lamb or pork. Mild spiciness for me. 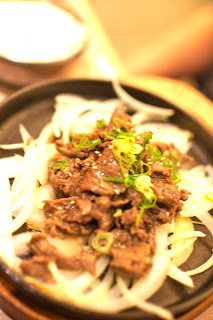 I like the pork which comes in small, tender pieces. They will crack the egg in for you which you can spoon the soup over or stir in. The combos of tofu + small meat (NT$360-380) are good if dining alone, but if you want to share meat with a few people, definitely stick to ordering the regular or large sized kalbi (NT$300-360) or bulgogi (NT$260-320) because it's lot heartier than the combo portion. Two bites and it's gone. 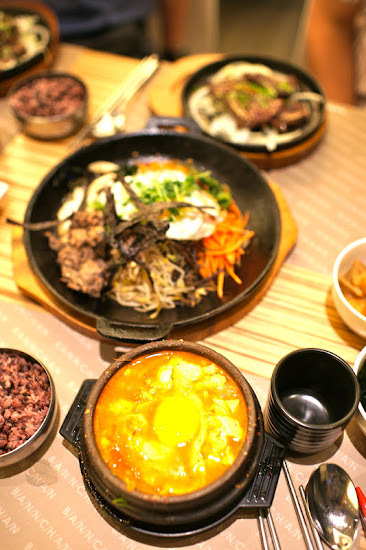 I wouldn't order the bimbimbap (NT$260) again because it doesn't come in a stone bowl and one of my favorite parts is the crispy burnt rice, and that's missing. It's pretty served on a flat platter to mix up, but doesn't feel the same. 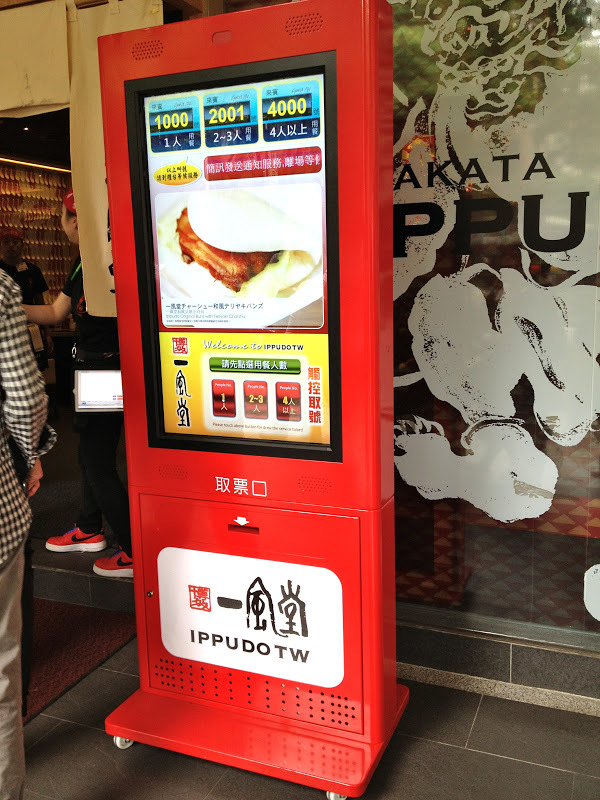 I'd get the cheaper and better tasting version at the food court instead. 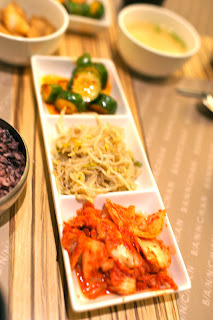 BANNCHAN is the first place that I've had Korean Fried Chicken, and of course now I'm addicted. The skin on the fried chicken wing (NT$160) is crisp as cracklins and when dipped in the sweet sauce, it's the perfect appetizer with the complete opposite texture and flavor to the soupy and spicy tofu. This is a must order here and something that I haven't found at other places in Taipei. Even though the photos are from last year, I went back recently last week for lunch over the weekend, which tends to be busier than the weekdays. The inefficient service still really frustrated me, but I kept my expectations low and just enjoyed the food. Just go prepared to serve yourself (got my own menus after waiting awhile for them) and wave down the waitstaff for everything. Has this ever happened to you? You secretly make some new year's resolutions to eat healthier, exercise more often, write snail mail to friends, watch Homeland, clean out your closet, as well as blog up a storm, but then real life hits and all of sudden it's already February. And all of the resolutions got postponed. Not to mention my laptop's "start up disk" is full so I have over a month's worth of travel and food photos from my iphone, s95 and DSLR to upload. Eek. Time to clear the digital clutter and reorganize. Opened over a year ago, Zoca Pizza is a casual little shop near Anhe Road, offering over 40 kinds of different thin crust pizzas on the English, Italian and Chinese menu, as well as a daily soup, a few salads, calzone, lasagna, and a pizza by the slice lunch set. There is also a wine list and house made limoncello. The variety of pizzas is quite overwhelming with all the choices, but luckily our friend helped us order. The pizzas also cook quickly and come quickly to the table, so you could always add a pizza after your initial order if you aren't full. I like to order different ones and share. You can even spy the chef making the pizzas in the open kitchen and firing it in the brick oven. 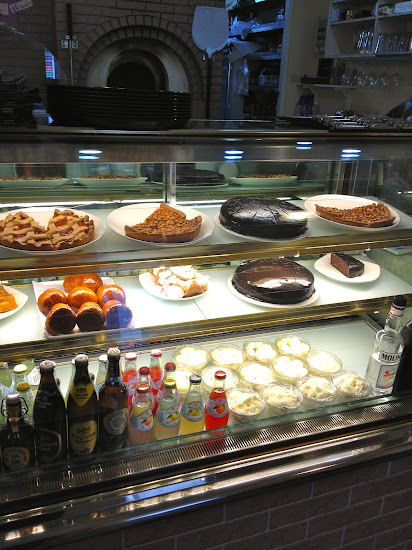 The waitress told us that the owner and chef of Zoca has been making pizza since he was a boy in Verona, Italy, and also learned how to make the Italian desserts and housemade gelatos that beckon when you walk in. The pizzas are large enough to share, so my friends and I ordered a few to try. 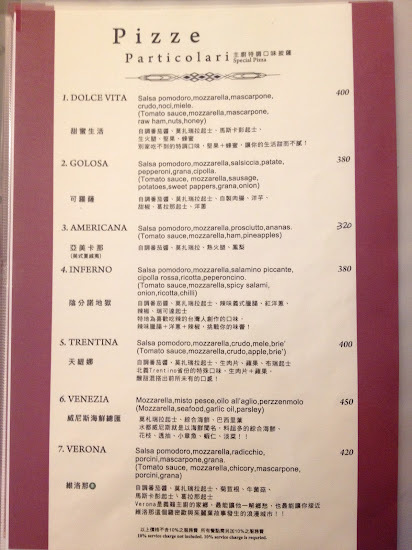 My friend recommended we come here insisted we order the Dolce Vita pizza (NT$400) and it ended up being my favorite of that day as well. Topped with prosciutto, mascarpone cheese, nuts and honey provide contrasting flavors and textures with the tomato sauce and cheese base. When my friend first described the pizza to me, I thought it was a dessert pizza, but it is quite savory and the creaminess of the fresh mascarpone really perfects the pizza. And the chewy crust is thin, but bendable and gives a great bite- not heavy and not crispy. 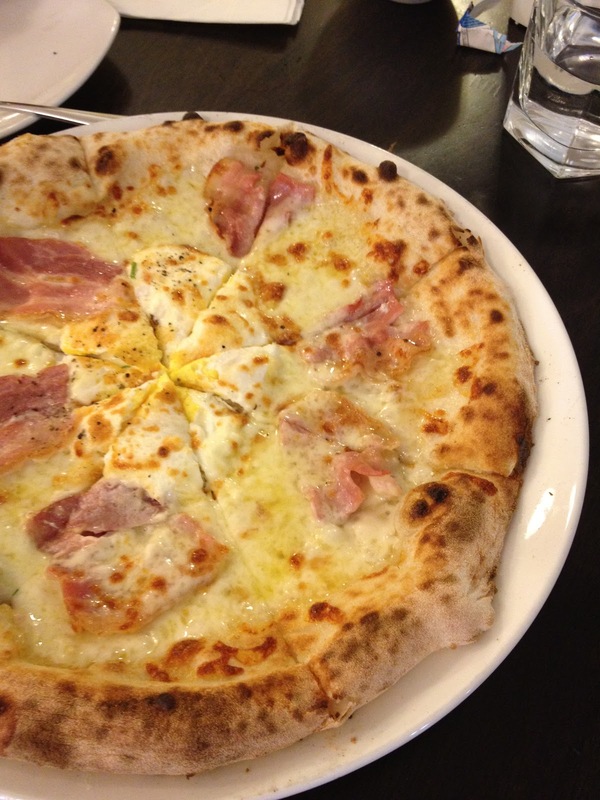 The neapolitan pizzas at Zoca are similar to Fifteen Pizza, for those of you that have been. 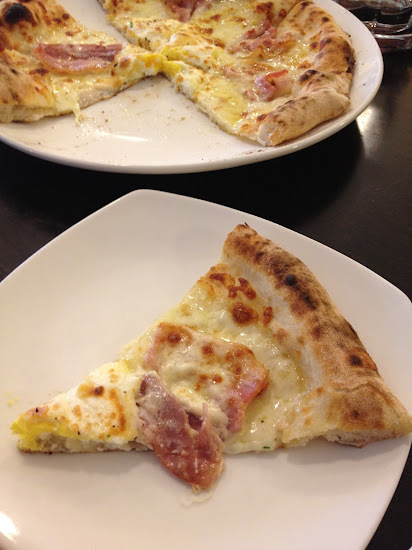 The carbonara pizza comes with a white sauce and topped with bacon and a well done baked egg. I missed the tartness of the tomato sauce with this one and prefer a less well done egg, but it might be good for fans of carbonara pasta. 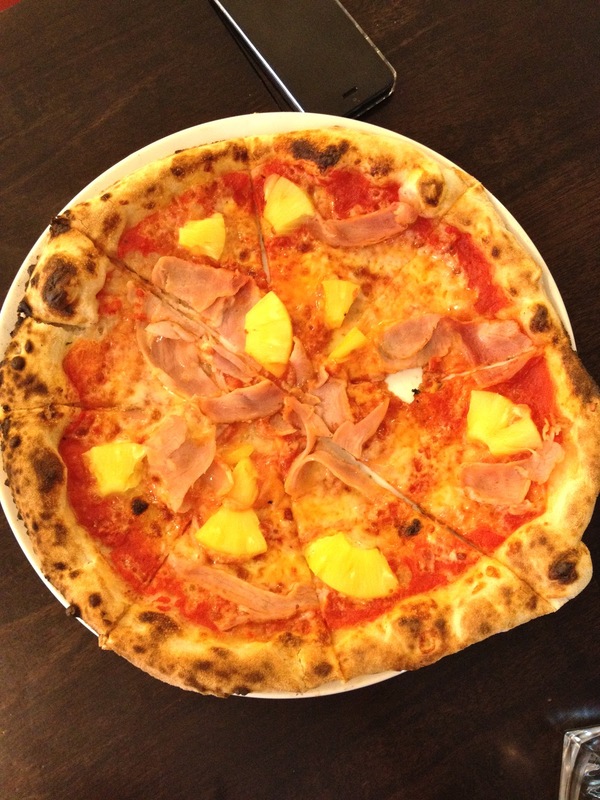 I thought it was funny (and very appropriate) that the pineapple and ham Hawaiian pizza was called Americana pizza (NT$320) instead. It reminded me of how we're so used to bastardized versions of other cuisines in America, but we end up craving it anyways because it's what we've grown up with. Like how some people look for or desire things like orange chicken and moo shu pork that are nearly impossible to find in Taipei because they are essentially Chinese Americana. We couldn't leave without trying the desserts, so we shared a hazelnut tart, a cannoli, and limoncello cake which they called bobo. I thought the cake would have a strong lemon flavor, but it was more of a strong alcohol flavor, which was actually too strong for me. Haha, you can tell I'm not a big drinker. 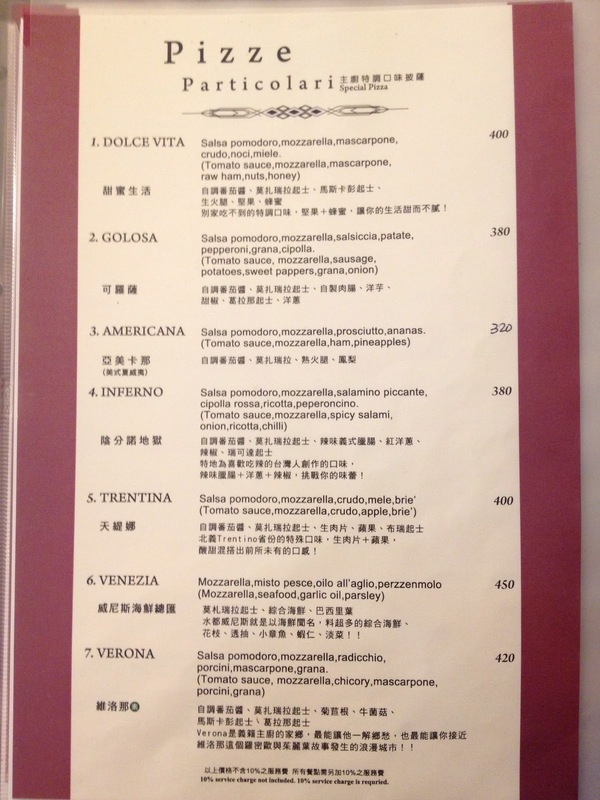 My favorite was the cannoli (NT$150), which I've only seen at Solo Pasta otherwise in Taipei. I'll have to come back another day to try a scoop or two of the Italian ice cream.